Yesterday, filmmaker Peter Jackson — the guy who made those lavish, but incredibly long, Lord of the Rings movies — announced his next project, and it’s pretty intriguing. Jackson has been given access to more than 50 hours of never before seen footage shot by director Michael Lindsay-Hogg during the Beatles’ recording sessions that ultimately were used to produce the album Let It Be. Jackson will be using the footage to produce what is, in effect, a remake of the documentary that was released in 1970. It’s hard to imagine that there is much new to be learned about the Beatles — they are clearly among the most loved, photographed, analyzed, and psychoanalyzed musical and cultural figures in history — but this unreleased footage may help to alter the storyline. I’ll be heading to the theater to watch the result. These days, how often do you have the opportunity to watch musical legends at work, in their prime? Kish and I have taken a break from going to the movies — the holidays were hectic, we were on the road, and the standard superhero and shoot-’em-up fare just isn’t very appealing — but we wanted to get back into the habit of identifying thoughtful, interesting films and supporting them with our ticket money. Yesterday, we went to see Green Book. It was an excellent vehicle for allowing us to reengage with the movies. Green Book tells the story of a brilliant African-American pianist, Dr. Donald Shirley, who decides to take his musical trio on a tour of the Midwest and then the deep South during the last two months of 1962. It was a brave decision intended to help spur social change, because in 1962 Jim Crow treatment of African-Americans, and legally enforced segregation, was still very much alive in the South. Dr. Shirley’s record label decides he should hire a driver to shuttle him from performance to performance and also help him to navigate the racist barriers that he will inevitably encounter. Dr. Shirley chooses Tony Vallelonga, a bouncer at the Copacabana who is temporarily unemployed while the club is undergoing renovations. Vallelonga knows how to use his fists and is nicknamed “Lip” because, by his own admission, he’s a consummate bullshitter who can talk his way out of a jam. The record label then gives Vallelonga the “Green Book” that gives the film its name — a paperback publication for African-Americans that tells them which hotels and establishments in the South will actually welcome them as guests and patrons. Dr. Shirley and Tony Vallelonga are an odd couple indeed. One is a virtuouso musician who is highly educated, extremely refined in his tastes, and impressively (and at one point in the film, surprisingly) multi-lingual; the other is a barely literate graduate of the school of hard knocks who has street smarts and a prodigious appetite for hot dogs, fried chicken, and just about everything else in life. And, Vallelonga is a product of the casual, everyday racism found even in the North at that time. According to the film, at least — the Shirley family disputes the film’s accuracy on this point — during the tour Dr. Shirley and the Lip overcome their differences and become friends. Dr. Shirley schools Vallelonga on his diction, helps him to write more meaningful and expressive letters to his wife, and exposes him to music, musical talents, and concepts that Vallelonga had never experienced before. Vallelonga, in turn, introduces Dr. Shirley to fried chicken and popular music and uses his bullshitting skills and street smarts to support and protect Dr. Shirley as he deals with racist treatment on a daily basis. The story of the friendship is entertaining — and Mahershala Ali, as Dr. Shirley, and Viggo Mortensen, as Vallelonga, are terrific — but the emotional core of the movie is found in its depiction of the Jim Crow South and the ugliness of its racist, segregated, hateful ways and of the people who stubbornly refuse to change. Whether it is the overtly racist small-town deputy enforcing a “whites only after dark” law, or a rich owner of a lavish house who won’t let Dr. Shirley use the bathroom in his home, or the country club manager who refuses to allow Dr. Shirley to eat in the dining room and pleads with him to “be reasonable,” the onslaught of racist ugliness is constant, jarring, and deeply appalling. Green Book is a powerful film that will leave you embarrassed, sick to your stomach, and shaking your head about a terrible chapter in American history. It’s well worth seeing. Last night we went to see First Man at the Gateway Film Center. The movie tells the story of Neil Armstrong, from his days as a test pilot flying the X-15 over the California high desert to his work as a NASA astronaut and, ultimately, to his step onto the Moon that indelibly wrote his name into the history books. It’s a riveting tale, and the movie leaves a powerful impression as it follows two narrative threads — the arc of the lunar space program and the equally compelling story of the impact on families. The film presents the life of the astronauts with intense realism, as they wedge themselves into cramped spaces atop enormous rockets, are routinely shaken to bits even in a successful launch, and have to deal with technical malfunctions that, in Armstrong’s case, left him in a Gemini capsule spinning out of control above the Earth and on the verge of passing out before he discovered a fix. Tragedy and death are an accepted part of the job, and above it all is the sense that the astronauts were playing a key role in an essential national mission. You can’t watch the film without acquiring a new appreciation for the brave and resolute men who were part of the astronaut program. But the home front tale is just as powerful. There, too, untimely death has a huge impact, and families struggle as husbands and fathers become increasingly absorbed in the mission and are frequently away. The wives shoulder the burden of keeping their families together and moving forward, listening worriedly to the mission control feeds in their suburban homes as TV crews and photographers and reporters jostle on the front lawns, and living with the oppressive reality that, at any moment, their husbands might be killed and there is absolutely nothing they can do about it. The grit and fortitude of wives and mothers were just as crucial to the success of the mission as the courage of the astronauts. 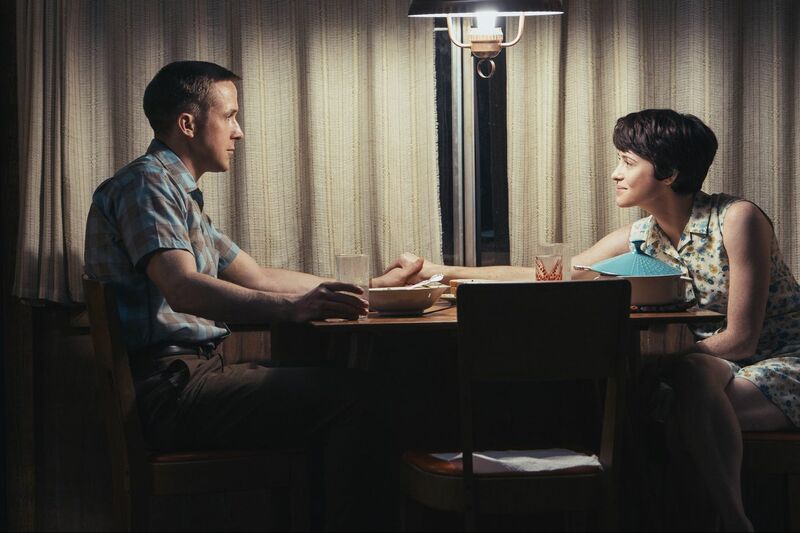 Ryan Gosling is terrific as Neil Armstrong, the buttoned-up and buttoned-down engineer who immerses himself in the mission and strives to keep his emotions in check, and Claire Foy is equally terrific as Janet Armstrong, the pillar of the family who holds it all together. The film is beautifully photographed and the sense of realism is total — from the buttons and switches and configuration of the spacecrafts to the shuddering rocket launches to the desolate lunar surface . . . and to the cans of Budweiser, the TV sets with rabbit ears, and the clothing that were part and parcel of suburban life in the ’60s. First Man is the best film I’ve seen in a long time; I give it five stars. And as we left the theatre I was struck by the thought that once, this country could come together to try to do great things — and then actually accomplish the mission. I wish we could capture more of that spirit these days. Astronomers want to know what’s out there beyond the orbit of Pluto, the tiny world that once was deemed a full-fledged planet but now is classified with the non-PC designation of a “dwarf planet.” Specifically, they want to know whether, far past Pluto’s orbit, the gigantic and provocatively named “Planet X” lurks in the dark interstellar void. And now they are beginning to find evidence that suggests that Planet X may actually exist. In 2015, researchers at Caltech concluded that there was mathematical evidence that there was a “Planet X” that followed a long, elongated orbit at the far outer reaches of the solar system. The Caltech team used data about the unique orbits of certain objects in the solar system, applied advanced equations and computer simulations, and hypothesized that the orbits were being affected by the gravity of a large planet with a mass about 10 times the mass of Earth that followed an orbit about 20 times farther from the Sun than Neptune. The hypothetical planet was called “Planet X,” or “Planet 9.” (Either planet name, in my view, would fit well in the title of a ’50s sci-fi thriller beginning with The Creature From . . . .) The hypothetical planet won’t get an official name, by the way, until it is actually discovered and its existence is confirmed. The Bread Crumbs Leading To Planet X wouldn’t be a bad name for a sci-fi thriller, either. Either way, it’s good to know that scientists are out there looking for evidence of whether we should add a long-lost, distant cousin to our solar system family.